The SmartCat Ultimate Scratching Post by Pioneer Pet is currently the number one best seller scratching post on Amazon. And it is easy to see why. It towers over other scratching posts by a good few inches allowing your cat to get one of the best scratching experiences. And it saves your furniture into the bargain. Well, the main desire is a good surface for your cat to scratch their claws on. If they are using a scratching post then they are not using your walls, doors or furniture. But what else is important? Most cats like to stretch out full length in order to scratch. This is so they can use their back and shoulder muscles. Almost like you do when you get out of bed and have a full stretch in the morning. However, a lot of actual scratching posts are not very tall. The cheaper ones on the market are usually only a couple of feet high – and a fully stretched out cat is taller than this. Also with cheaper posts, they are not completely stable. So when your cat stretches they pull the post over. How many times has your cat pulled over their small scratching post and then refused to use it? How the Smartcat Ultimate Scratching Post is different. First up this scratcher is 32 inches in height so will allow a full stretch. Even a longer cat like my Ragdoll can get a full stretch going. Secondly, the base is 16 inches by 16 inches so a good size. This is sturdy and keeps the post from tipping over. So when your cat pulls it from the top it does stay upright. Thirdly, the post is wrapped in a fibrous woven sisal which is preferable to carpet wrapped posts. Carpet can snag claws whilst sisal allows a full range of motion without snagging. Sounds good? It does on paper but the proof is always in the setup and trying it out. My level of DIY is basically managing to put together Ikea furniture. Though I am now able to build a number of cat trees. I still like easy to set up items though and the ultimate scratching post actually filled this requirement. Basically, it arrived in two parts with just two screws to fit. Even I can get this right. The base contained two predrilled holes – so just fit the post over the top of these. Then screw in the two screws – simples. This is always the big test – does my cat like it and does she use it? Dyson is actually used to scratchers so she goes straight to it and stretches right up. These ideas should get your cat used to the feel of this under their paws. The Smartcat Ultimate scratching post is also very smart looking. We have a nice wooden base and wooden top. The sisal covered post is square shaped so your cat can grab both sides. However, the top of the post whilst it has a small platform is a little small for lying on. It is also a bit slippery if your cat tries to jump onto it. So this scratching post is just a scratching post and does not work as a perch. You can’t rotate the scratching post if part of it gets more wear. This is a nice alternative to the Mondo Cat Scratching Post at a quarter of the cost. Whilst it is not as functional (no cat perch) and not as durable it is still great for the money. I must admit I would have liked the ability to rotate the actual scratching post. This would double the life of the scratching post as if the top gets worn you could then turn it around. The worn part would then be down by the base. Overall though I am pretty pleased with the Smartcat Ultimate Scratching Post. We give this a big paws up especially on the price. If you want to order one of these then the SmartCat Ultimate Scratching Post is available from Amazon. Wow this looks really good. It will go well in my living room. The color and style of it will just blend in well. Quick question, does this shed or will I see bits and pieces on the floor after my cat scratch it? Hi thanks for your query. This shouldn’t shred as it is designed to last for a good couple of years of scratching use. This scratching post would be a good fit for my parents’ cat as he NEVER plays with the toys that we buy him. So yeah we don’t like to spend too much money on him. Hi Evie, thanks very much for that great review. I know from my own experience how much my cats loved scratching posts, but equally important was the ability to hide, climb and perch. I’ve had the climbers so they get everything in one. Although they couldn’t climb on this particular one, I think it’s handy, and cheap enough, to have a couple in different rooms. They can’t expect a huge cat tree in every room can they!! Thanks for calling attention to this product. I love this scratching post. I have two cats and we go through scratching posts pretty quickly. I have two large robe ones that they love. One is so bad, we have to replace the ropes. We also have a few cardboard ones, but they end up making a mess on the carpet and I have to vacuum constantly. 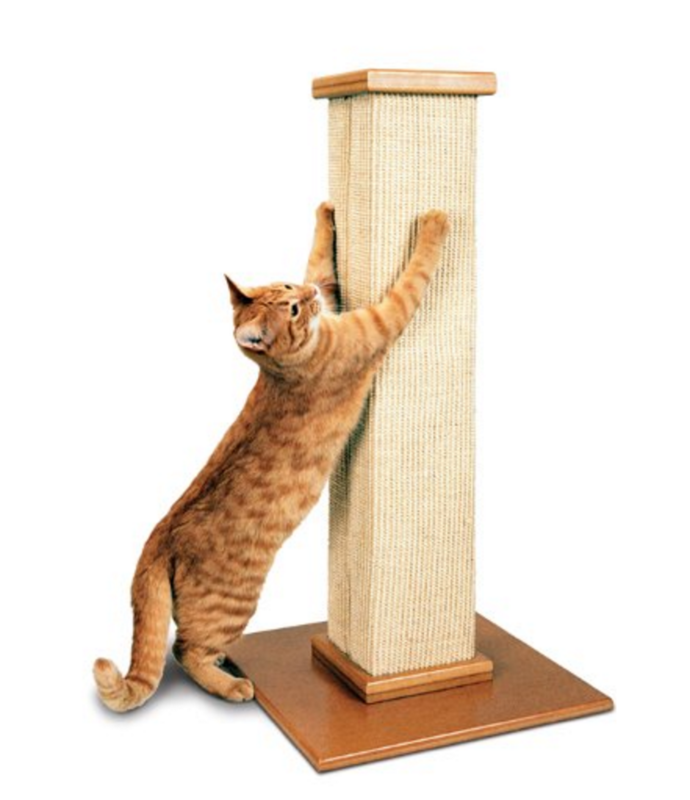 I really like this smart cat scratching post because of the height. This looks like a great cat scratcher! I just had to get rid of my 5′ cat tower (which had a scratching post) – my 2 cats are getting older and don’t use it much anymore so I want to replace with something else. This looks excellent, and well made. Are you sure there is no screw under the base to switch it around if need be? Probably not be a big deal. Awesome site by the way – thanks! Hi Evie, thanks for your review. This smartcat scratching post seems quite reasonably priced compared to the Mondo which is quite expensive. For the price though I would consider buying this one even though you can’t rotate the scratching post. With the slippery top I’m wondering why the surface would be like that? But anyway, could you not affix some material or something to the top? Although that would be more of an expense it would help the problem. 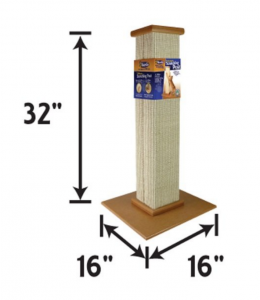 If you want to make sure that you are getting a durable scratching post that is going to hold up well, even in a multi-cat household, this is a great option.